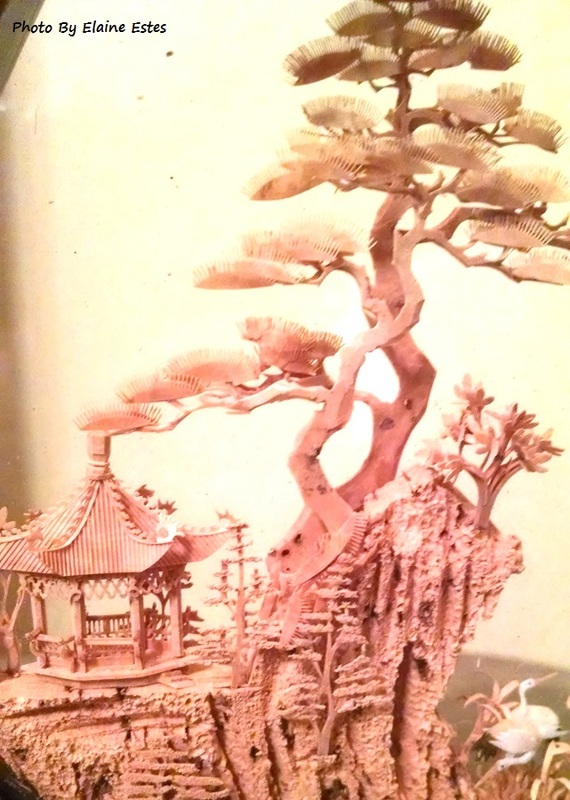 Cork wood carving of bonsai trees on a mountain top. This is a story I read and loved as a child. Since I don’t have the book, I’ve told the story as well as I could remember it, but with a few of my own embellishments. Once upon a time a poor farmer, his wife and five children lived in an average sized but nice farmhouse. But as all of us feel dissatisfied with some part of our lot in life, the wife began to complain to her husband that their house was too small. “Go to the wise man on the mountain and ask him what we must do to make more room in my house!” She nagged and complained so much, that the poor farmer couldn’t listen to her any more. He left the next day to see the wise man at the top of the mountain for advice. The first trip to the wise man. After a day’s journey, the farmer reached the small, quaint house of the wise man and told him of the predicament at home. The wise man, thought for a few minutes. “You are to go home and bring the chickens into the house to live,” the stunned farmer heard from the lips of the wise man. The poor farmer bowed and thanked the wise man and returned home to relay the strange words of the wise man to his wife. Being that the order came from the wise man, the wife said nothing and complied. Within a week, there were 10 chickens racing around the house, getting into the food, nesting and laying eggs in very inappropriate places, and leaving excrement everywhere! After the first week the wife ran screaming from the house. Thinking this strange the poor farmer bowed, thanked the wise man returned home and relayed the wise man’s shocking new strategy to his wife. Shaking her head, she complied, hoping that soon her house would be bigger. The chickens continued with their previous behaviors. Now there were three fat, noisy, smelly pigs chasing around in the house, laying about on the floor, sleeping, and sticking their noses into every piece of food around. After four days, the poor wife ran screaming from the house. The farmer wearily meandered up the mountain, wondering what the wise man might suggest this time. The new solution was one he certainly did not expect. With great dread, the farmer hesitated to go back home, but it was, after all, what the wise man had suggested. So the cow was brought into the house. Less than three days, the wife ran screaming from the house. The farmer relayed the message to his wife. The words were hardly out of his mouth than the animals were sent scurrying out of the house. The next two days the husband, wife and children cleaned the house, swept the floor, washed the tables and chairs and windows and invested a lot of time to make the house their home again. The wife never complained again about the size of “their” home and was so proud of their newly cleaned home, she never even wanted to move. This home was their home now. She and her husband and the children lived there for many years and thereafter always had enough room for a sneeze. When we set up residence in our past with the feelings, pain, disappointments, anger and fear from it, we have less room to make a new life. Empty out the old life to make room for a new life with new experiences, new confidence, new knowledge and acceptance of who we really are or can become. Make your life YOUR LIFE. I love ancient wisdom stories. You will be seeing more of them in the other posts here. Thank you so much for commenting. Wow! lol I love this story! So true. Sometimes, we just have to let go of all the debris, clear out the clutter, so we can make room for something new. We do this process for our house, why not our lives? Thank you so much for sharing this story. I needed to hear that. I feel a bit like this with all of our dogs, but I don’t think that I’ll be able to kick them out 🙂 I’ll just have to figure out to make more life-room some other way! I am delighted that you enjoyed this old tale as much as I did. Thank you for sharing it!! A beautiful story. And a thought Provoking moral. Youl will be coming back to this one. I know I will. I had a friend who always used to say he had to give away money to a charity in order to make room so he could earn some more money. I always liked that image and I like the idea of emptying out an old life to make room for a new one. Nice! Oh this is such a wise story. Enjoyed thoroughly. Thank you. So happy you enjoyed it. I love the points it makes so well.